A UK beauty spot is being plagued by ghostly sightings of the Slender Man, it has been claimed. The 8ft stick-thin spectre has been spotted by several terrified residents of Cannock Chase in Staffordshire over the last month. Locals have reported seeing the ‘lean, shadowy spirit’ with ‘blood red eyes’ and wearing Victorian dress in the forest as well as their homes. Each of the chilling close encounters took place in the small mining town of Cannock, which has a history of supernatural sightings. One resident of Pye Green said she was visited on December 14. She explained: ‘I was awoken just before 2am by an odd scratching noise in my bedroom. ‘To my astonishment, there was what seemed like a sphere-shaped shadow by the edge of my wardrobe. ‘As I tried to get out of bed and investigate further, the shadow began to stretch towards the ceiling. It was at that point I found myself faced with the most disgusting and horrific creature imaginable. Another householder, from Rugeley, said: ‘As my eyes opened, I saw a man floating over me. ‘I could see into his eyes, they were a fierce red colour that shook me to my very core. Now investigator Lee Brickley is trying to work out why the child-snatching Slender Man, who is feared across the globe, has suddenly started appearing. Lee, 28, said: ‘To get so many sightings at roughly the same time is unusual. ‘One theory is that this has nothing to do with the supernatural and eye-witnesses are experiencing sleep paralysis, where individuals’ eyes are open but they are still in a state of sleep, and therefore unable to move. Slender Man has been a part of global folklore for centuries. In Scotland the fiendish figure is known as Fear Dubh (The Dark Man), the Dutch dubbed him Takkenmann (Branch Man) and in Germany he is referred to as Der Grosse Man (Tall Man). 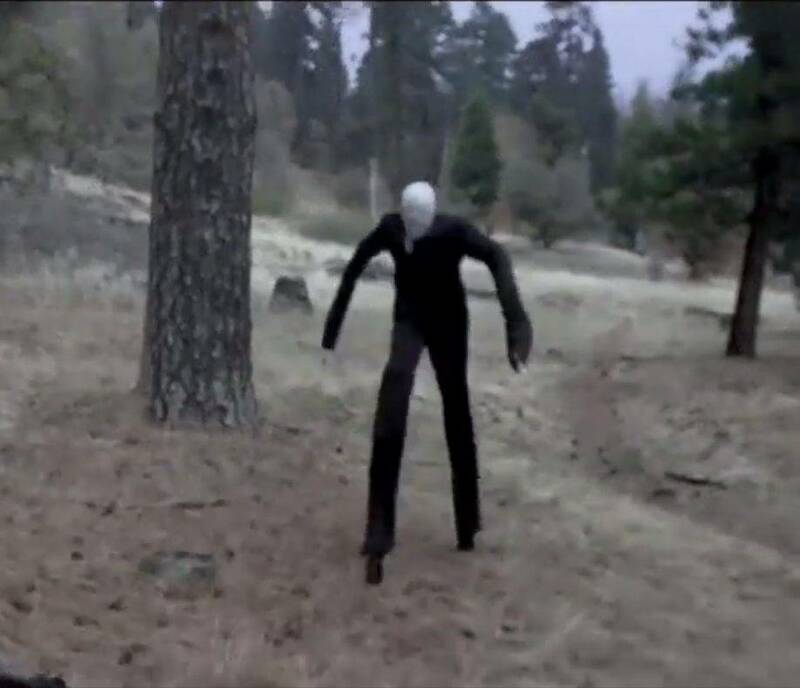 Dressed in a black suit with a white silhouetted face, the floating figure is tree-tall, has several long-stretching limbs, and is said to lurk in forests where he abducts children. While many believe the supernatural being to be a myth, the story has inspired some horrific crimes. In May last year, two girls from Wisconsin, USA, stabbed a 12-year-old classmate 19 times, claiming they wished to commit murder so they could become ‘proxies’ to Slender Man.